While fly-fishing for wild Tasmanian brown trout is the premier attraction there are a number of different activities available to the non-angling partner. London Lakes is home to a host of native critters that can be seen up close in their natural, undisturbed habitat. A guide can show you in detail or you can explore for yourself while breathing the fresh air and leaving behind unwanted distractions. Our international standard fly fishing lodge accommodates fly fishers and their partners when it is not required for use by its owners. London Lakes Lodge welcomes lady anglers. Beginners are also welcome. Most experienced fly fishermen need tuition in the short distance and tandem fly casting techniques required for the Tasmanian fishery. 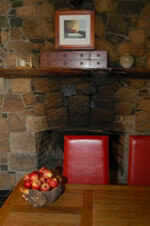 The Lodge is small, private and beautifully situated. It is handcrafted from Tasmanian celery-top pine logs and field stone. Its internal woodwork features exotic Tasmanian species. It is available by negotiation for groups when it is not being used by the owners to host the visitors they accompany to London Lakes as their guests during the season. The farmhouse sited on the shore of Lake Big Jim is available all year for client use. 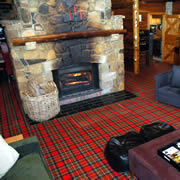 The Lodge accommodates ten persons in five twin-bedded rooms, each with its own bathroom. 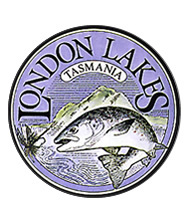 Built in 1984, the Lodge was refurbished in 1998 and became a welcome venue for International anglers seeking the very best of Tasmanian fly fishing. The expert team of London Lakes' professional guides is friendly, courteous and professional. 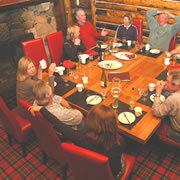 There is a nine hole "highland" golf course and tennis courts twenty minutes from the Lodge. Lake St Clair, the deepest lake in the Southern Hemisphere with boat trips and National Park ideal for trekking, is also twenty minutes from the Lodge. One hour’s drive from the Lodge is one of Tasmania’s best craft shops, the internationally renowned Wall. Photography, bushwalking, birdwatching and painting are all popular pastimes for the non-angler at the Lodge. 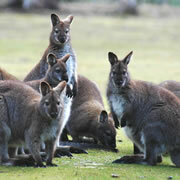 Evening animal safaris can be taken to view the wide range of marsupials. Wallabies, and on occasion platypus and echidnas can be seen during the daylight hours. Possums, wombats, quolls (marsupial cats) and Tasmanian devils are seen on the night safaris. Eighty six varieties of birds have been recorded on the property. For visiting bird watchers London Lakes provides a London Lakes bird list and observation record book as a lasting memory of your visit to London Lakes.